View More In Italian Style. 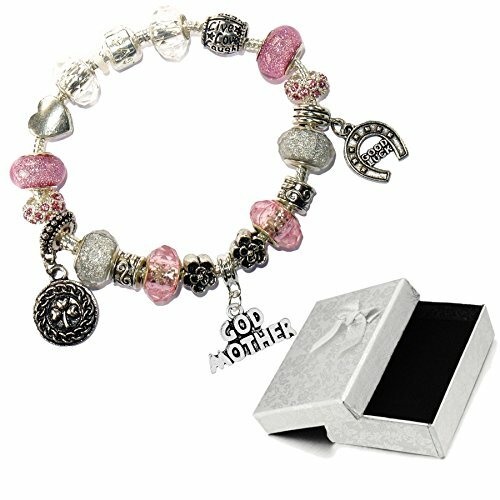 Beautiful Godmother Themed Pandora Style Charm Bracelet with Ribboned Gift Box. Bracelet, Charms and Beads are All Lead and Nickel Free. We normally stock bracelets in all sizes from infants to Large Adult. .
TO GET AN ACCURATE BRACELET SIZE WE DO ADVISE THAT YOU MEASURE THE WRIST IF AT ALL POSSIBLE, Where measuring is not possible, see sizing guide below. 15cm (Infant), 16cm (3-7yrs), 17cm (8-12yrs), 18cm (young adult), 19cm (small adult), 20cm (standard adult), 21cm (medium adult), 22cm (large adult), 23cm (XL Adult). If you have any questions about this product by Charm Buddy, contact us by completing and submitting the form below. If you are looking for a specif part number, please include it with your message.